He descends from a noble house in Begnion, but the family fell to ruin during his parent’s generation. Muarim has been his companion since then. Tormod and Muarim are the heads of the so-called “Laguz Emancipation Army” based in the Grann Desert, located in northern Begnion. Though a laguz emancipation act had been officially passed in Begnion, plenty of nobles still keep plenty of laguz slaves illegally. The army exists to completely eradicate this practice. Tormod dreams of a world where beorc and laguz can freely live together like family in peace. 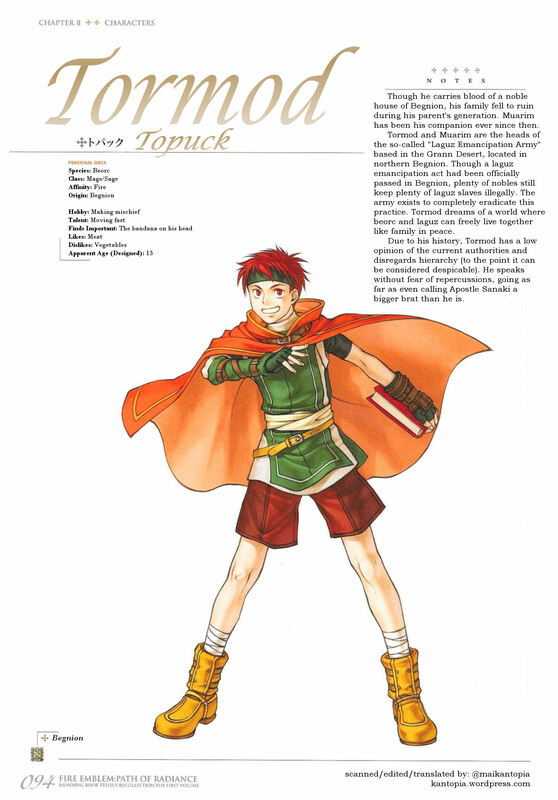 Due to his history, Tormod has a low opinion of the current authorities and disregards hierarchy (to the point it can be considered despicable). He speaks without fear of repercussions, going as far as even calling Apostle Sanaki a bigger brat than he is. I’m not sure if it was ever established in-game that he is of an ex-noble family. So that may be some new information from this profile. This entry was posted in Artbook, Fire Emblem, Translation, Video Games and tagged character, character design, concept art, english, Gamecube, guidebook, intelligent systems, japanese, memorial book, nintendo, path of radiance, profile, tellius recollection, topuck, tormod, Trivia. Bookmark the permalink.